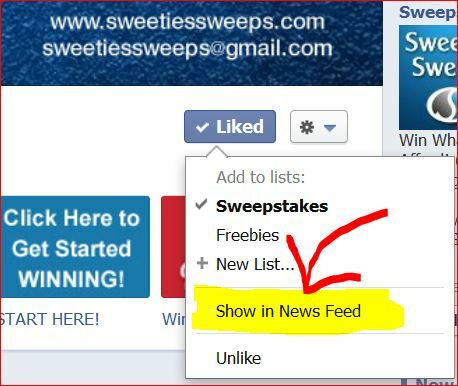 I just learned a simple way to make sure you see the Sweeties Sweeps Facebook posts, in your News Feed. This will work for any other Fan Page you want to make sure you see in your News Feed. Please do the same if you follow Sweeties Freebies Facebook Fan page too. Who knew it was that easy! Yippee!! I too have done that with yours and other pages and your page does not show up however I do get the Sweeties Freebies page. I did make a “likes” page and Sweeties Sweeps is visible, but it would be easier if the page would show on my news feed.